In Florida, we have specific laws in place that address injuries caused by civil wrongs that include: 1) the failure to use reasonable care (negligence), 2) providing an unsafe or defective condition on property (premises liability) and 3) spoken or written words that harm a person’s reputation (defamation). These personal injury laws are written to make victims whole when they are injured in a car accident or slip and fall by providing compensation for medical expenses, pain and suffering, lost earning capacity and the loss of the enjoyment of life. The good news is that most personal injury claims settle out of court because of the certainty provided by these laws. However, there are instances where victims are left to file a lawsuit to obtain justice for their injuries, which can take months or even years before a fair resolution may be achieved. Unfortunately, time isn’t the only risk a victim may face when dealing with a personal injury lawsuit. 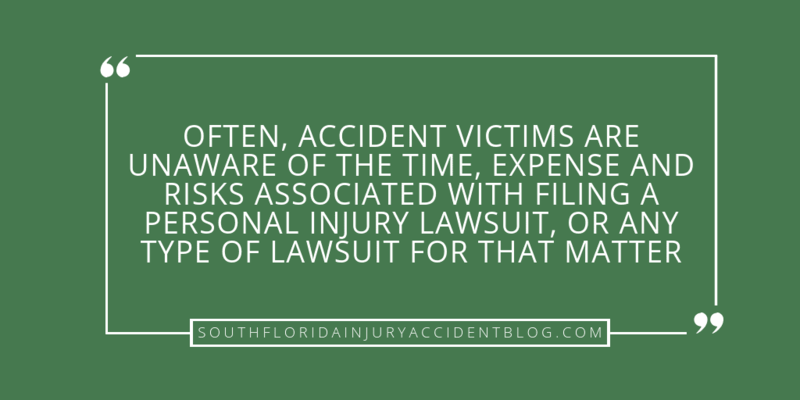 Often, accident victims are unaware of the time, expense and risks associated with filing a personal injury lawsuit, or any type of lawsuit for that matter. For example, even if a victim prevails at trial, the amount of money he or she may recover may not be enough to cover the expenses of hiring experts, paying a lawyer, and paying medical providers. After a victim has had their life turned upside down, a defendant can make a request for the presiding judge to review the lawsuit and dismiss it without it being submitted to a jury for their consideration. Dismissing a case means that the judge has signed an order ending the lawsuit (it can be done for substantive reasons, like the plaintiff failed to state a claim or provide sufficient facts to warrant a lawsuit, and/or technical reasons, like the defendant wasn’t properly served with the lawsuit). Fortunately, in some instances, the lawsuit can be refiled (if the lawsuit was “dismissed without prejudice”). In other instances, the lawsuit may be blocked from ever being filed again (that happens when the lawsuit is dismissed with prejudice). Does the court have the power to hear the lawsuit? Does the judge have authority over the people involved in the case and/or the power to address the subject matter of the lawsuit? Should the injury lawsuit be filed in state court or federal court? In Florida, some personal injury claims may even be a tribal matter. For instance, some slip and falls at the Hard Rock Café and Casino must be heard under tribal law. Lawsuits must be filed in the proper county. If a victim is hurt in Miami, can the lawsuit be filed in Broward County, simply because it is more convenient for the victim? The likely answer is no. Often, accident victims have to difficulty determining the correct party to sue. For example, if a victim slips and falls and breaks their arm at a shopping mall, then they would need to sue those responsible for that accident. In this case, the victim may want to consider suing the owner of the mall, as well as the owner of the store, and even the operator of the cleaning company contracted to keep the floors clean. If a defendant can show they are not a responsible party, then the judge can dismiss the lawsuit until the victim is able to identify and serve the proper party. After filing a lawsuit, the defendant normally responds by filing a formal “answer” to the complaint. Thereafter, the discovery process begins, which is where each side requests documents and information from each other and from other parties who may be helpful to the case. For example, during discovery, the accident victim can request that a store turn over its incident records or surveillance video. Also, a store manager can be deposed by the victim to get sworn testimony of things like what he or she saw and heard that day. After some discovery has occurred, a defendant may then move or ask the court to enter a judgment in its favor, and end the lawsuit, because there are no issues in dispute or because the lawsuit was filed after the statute of limitations has passed. In Florida, personal injury cases have to be filed within a certain time frame. The Florida Legislature has set these deadlines in specific statutes, called statutes of limitations. According to Florida Statute 95.11, personal injury claims must be filed within 4 years from the date of an accident. If a victim does not meet that deadline, then no matter how serious their injuries may be the lawsuit will not be permitted to continue. By law, the judge is required to grant a motion for summary judgment in favor of the defendant, thereby ending the lawsuit forever. Most personal injury claims in Florida do not go to trial. Many of them don’t even reach the courthouse as a lawsuit. The great majority of accident claims are settled between the parties in pretrial settlement negotiations. For those cases that don’t settle, the victim is left to file a lawsuit to have a jury determine if compensation will be awarded. In order to win at trial, an victim will have to prove liability and damages, which can be time consuming and expensive to do. It can take time to gather what is needed to meet the accident victim’s burden of proving liability and damages. During the discovery process, the victim’s lawyer will send interrogatories (written questions served to a person requesting answers under oath), find and discuss the case with expert witnesses, send out requests for production (documents such as medical records to review), and submit to the defendant requests for admissions (for the purpose of having the adversary admit or deny statements given by the person serving the request.) Preparing, sending and reviewing this information can take weeks or even months to complete. In addition to discovery, litigation can be delayed due to the time it takes to set and attend hearings. For example, if a Plaintiff files a motion to compel a defendant to provide better answers to discovery, then that motion needs to be heard by the judge presiding over the lawsuit. The Plaintiff will get a date and time for the hearing, but that happens only after coordinating a time and date that works for the adversarial party. This process of exchanging emails and phone calls to review calendars and find a date that suits both sides can be tedious. There is also the risk that the only available dates for a hearing are weeks, even months, in the future. A major expense in personal injury litigation are expert fees. Written opinions from medical professionals may necessary to evaluate things like permanent bodily harm and lost earning capacity. Doctors’ rates to support damage claims are expensive. Sometimes, an accident reconstruction expert will need to give an opinion on what caused the car crash or slip and fall injury. Engineers may charge an hourly fee to prepare and present their expert analysis of fault and liability. Litigation costs can pile up quickly. These include filing fees, deposition transcriptions, court reporter costs, photographic and video production and even copying costs. The good news is that the victim’s personal injury lawyer will advance all of these costs and the victim will only be required to reimburse the lawyer if he or she is able to obtain a settlement or verdict against the defendant. In Florida, there is the possibility that a plaintiff will not only lose the case, but also the court will order the victim to pay the legal fees incurred by the defendant or the defendant’s insurer. If an accident victim has substantial assets, there could be a great risk in not accepting an offer of judgment served by the defendant. That is a large risk for an accident victim to consider when deciding between accepting a proposal for settlement from the defendant or going forward with the lawsuit and letting a jury decide the value of their claim. Does this seem unfair? It may be unfair but it is the law. The result of this can be that the plaintiff does not receive a final result that is more than 75% of the offer. If, for example, a plaintiff requests a $100,000 offer of settlement and they only award $50,000, then the defendant is entitled to have its attorney’s fees and costs incurred from the date of serving the offer of settlement deducted from the $50,000 award. The plaintiff may end up with a judgment against him/her, especially when the jury awards little to nothing and an offer of settlement was made by the defendant. How does the defendant collect? Just like any other bill collector. A judgment is entered by the judge and filed in the court house records, stating that the plaintiff owes the defendant a set amount which covers both costs and attorney fees incurred by the Defendant. What if the defendant’s costs and fees total more than the judgment against the defendant? Then the court will enter a judgment for the defendant in a net amount (total court costs and legal fees less amount of the judgment against the defendant). What if the defendant has insurance that provides a legal defense? The plaintiff will still have to cover any judgment even if the defendant has an insurance policy that covers legal expenses. The insurer for the Defendant is entitled to recover its attorney’s fees and costs incurred from the date of serving an offer of judgment to the Plaintiff. Here in Florida, the legislature has passed statutes that “cap” damages in some kinds of personal injury cases. This has been done in the public interest as decided by the lawmakers. Damage Caps set a specific amount that is the maximum the accident victim is allowed to receive in their personal injury claim. That’s all the victim will be able to recover from the defendant, doesn’t matter how serious he or she has been hurt. Punitive damages are another kind of damage that is capped (limited) for Florida personal injury claims. If a victim is hurt in a car crash or a slip and fall due to a wrongdoer’s reckless and wanton behavior, then a victim may feel that those responsible should be punished beyond making the victim whole. That is the purpose of punitive damages: to punish the wrongdoer, independently of the amount of damages proven to be suffered by their victim. See our earlier discussion on punitive damages for details. However, punitive damages are limited (capped) in Florida personal injury cases. Under Florida Statute 768.73, punitive damages can be no higher than 3 times the amount of compensatory damages or $500,000.00, whichever is greater. Medical malpractice claims have additional Damage Caps under the Florida statutes. See Florida Statute 766. 118. These are special limitations placed upon negligence claims against health care providers. They limit recoveries even more than the standard damage caps for personal injury claims. Personal injury lawsuits, like most lawsuits, comes with risks. Risks related to time, money and, in some instance, a victim’s well being. If you have suffered serious damages in an accident here in Florida, and are considering settling your case or are assessing the risks of filing a lawsuit, then a good piece of advice is to speak with an experienced Florida personal injury lawyer to learn more about some of these issues, including how most insurance companies normally respond to personal injury claims claims and the type and amount of damages you may be entitled to recover. Most personal injury lawyers, like Alan Sackrin, will offer a free initial consultation (over the phone or in person, whichever you prefer) to answer your questions.